QUEENS — A long-awaited $25 million project to improve access to one of the busiest subway stations in Queens is nearing completion, the MTA said Monday. Work at the 71st Avenue station in Forest Hills, where the E, F, R and M lines stop, started more than two years ago and was initially scheduled to be finished in January 2014. The project was delayed, in part because of problems related to Hurricane Sandy as MTA employees were dispatched elsewhere in the city to restore the flooded subway system, according to the MTA. Required electrical work also took longer than expected. But on Monday, MTA spokesman Kevin Ortiz said that "most of the work will be done by the end of this month." He also noted that the agency "will be planning a ribbon-cutting event for April." The $24.7 million project will bring three elevators to the Forest Hills station, including one at street level, a significant upgrade for wheelchair-using commuters. Currently, the closest subway stations with elevators are Union Turnpike in Kew Gardens and Roosevelt Avenue in Jackson Heights. The project will also bring two new mezzanine-to-platform staircases to the station and improve electrical and signal installations. 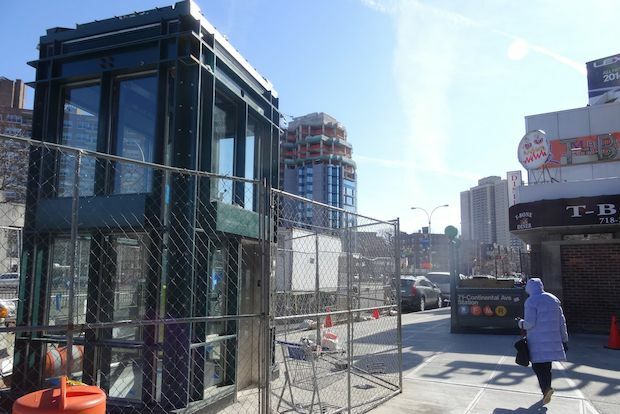 One of the station's exits on the south side of Queens Boulevard — which has been closed because of the elevator work — will also be reopened. Residents have often complained that a second entrance on the south side of Queens Boulevard was congested during construction. The Forest Hills station is among the busiest in Queens. In 2012, it ranked fifth in ridership in the borough, with average weekday ridership of about 27,500 people, according to the MTA.